The Gorillaz just released a new song called Let Me Out as I type this. My phone buzzed and everything. But more on that in a bit. I know they’ve been aging with us, but it’s still weird to see cartoon characters all grown up. Photo courtesy of RedBull.com. It took me a few days of listening to collect my thoughts on the four songs off Humanz we’ve witnessed so far. I’ve got mixed feelings about all of them, but they’ve only made me want to hear more. We know how the Gorillaz operate; the album is a message, so getting bits of it at various intervals isn’t satisfying. It’s like eating a steak dinner over the course of a week. But they put enough thought into their art to make it worth a six-year wait. And that’s why I love the Gorillaz. 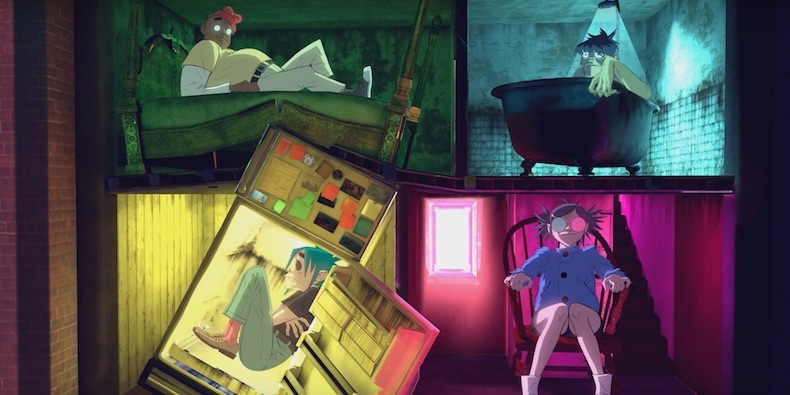 Photo courtesy of the Gorillaz YouTube. Hallelujah Money was released at an interesting time, all by itself. It drew tons of criticism for being “un-Gorillaz,” and its critics were further criticized for being critical. I have a few thoughts on this that you’ll likely want to hear, seeing as you’re reading my blog: The Gorillaz work hard to not have a typical style. In fact, their style is that they don’t have a style; they experiment outside of their genre. It adds mystique and rejects structured normativity and it’s what drives fans crazy with delight. All I can think is when fans listened to Hallelujah Money and thought, That doesn’t sound like the Gorillaz, they really meant was, That doesn’t sound like Plastic Beach. My other opinion on this matter is that you can be a fan of something without loving everything about it. Example: I think the US is pretty neat, but I also wish we didn’t have a Cheeto as president. 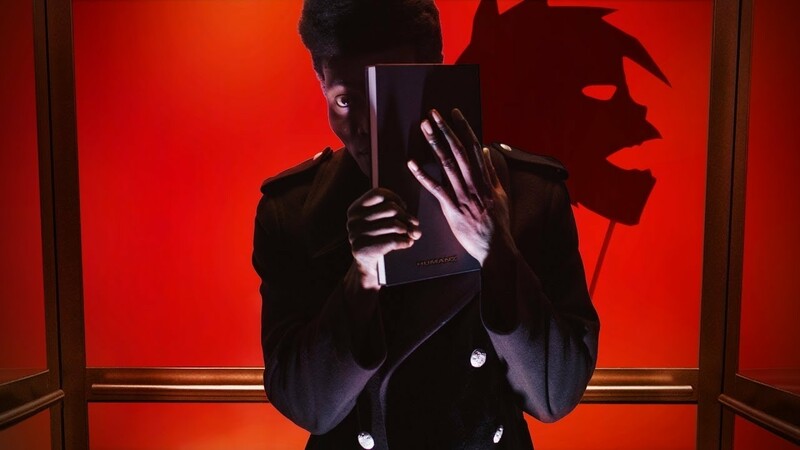 If you’re one of the people worried you’re not a Gorillaz fan because you don’t like what you’ve heard of Humanz, or if you’re on the opposite end telling others they’re not Gorillaz fans because they don’t like what they’ve heard of Humanz, cut it out. But back to its release date: January 19th, 2017. The day before the presidential inauguration. The Gorillaz’ music has always been attune to what’s going on in the world at the time, and though it was written several months before the election, the creators admit that afterwards, the album took on a new meaning. I won’t badger you with my analysis of the significance of its release date and it’s lyrics; I’ll provide a few of my favorite lyrics here and leave that to you (and if you can tell me what the Spongebob wail at the end of the song means, you get bonus points). Next up is Ascension. I’m not an EDM person, so I’m not a fan of this one, but it sure does have some killer lines. 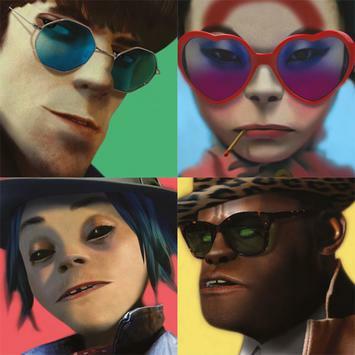 Albarn himself said in an interview that Humanz is a “party, club record,” but it has a “weird darkness about it.” Saturnz Barz is what really got me. The video was crammed with references to horror films, likely the work of Jamie Hewlett, who’s a huge fan of the classic thrillers. The main theme of the Clint Eastwood video and the ends of Rock the House‘s video are inspired by the horror genre. As it’s clear most of the visual budget was diverted to the Saturnz Barz video, I’d recommend watching it multiple times. There are tons of hidden gems in the details, the first being a creepy face in the basement window appearing only four seconds in! Photo courtesy of Something About Magazine. We got the Power and Andromeda came next, judging by the corresponding music videos. Though similarly to Ascension‘s video, it’s clear the creatives didn’t invest as much as they did in Saturnz Barz. This is surprisingly common for the band. Tomorrow Comes Today‘s video was done in two weeks, as Jamie forgot he had a deadline for the project after animating other videos for their Gorillaz album. I was intending to weigh in on Let me Out, but I’ve only listened to it three times. As any Gorillaz fan knows, that’s not nearly enough if you want to understand the song. Their music is so intricate and thought out, enjoyment comes with familiarization of each album. This is why I’m excited for the end of the month. Three weeks doesn’t sound like too short, but stand by! Humanz will be released on April 28th.